1725 - qui on servi a l'etablissement et aux progrez de la Compagnie des Indie Orientales, formée dans les Provinces Unies des Païs-Bas. [With] Voyage de Gautier Schouten aux Inides Orientales, Commencé l'an 1658. & fini l'an 1665.10 vols. 55 maps & plans mostly folding with 6 of (10?) 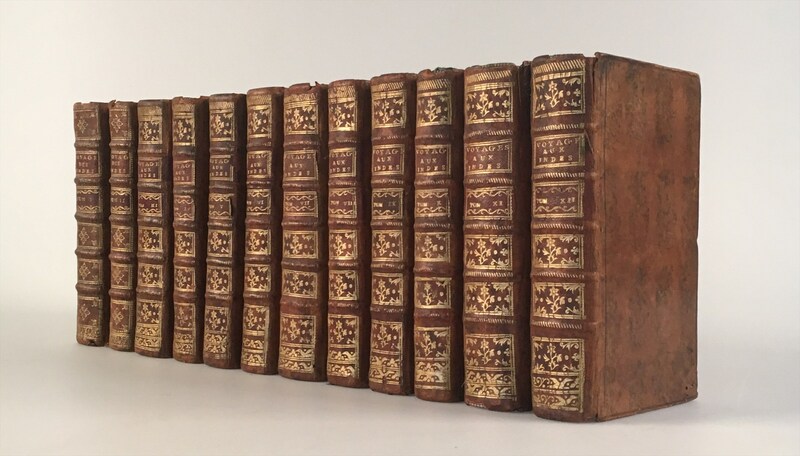 frontispieces (Renneville) & 2 frontispieces & 9 plates (Schouten). 12mo. Lovely unsophisticated contemporary calf, vols 3-10 of Renneville uniform with Schouten (stamped as vols. XI & XII), vols. I & II of Renneville with slightly different tooling. Rouen, Renneville translated Commelin's great Dutch work, first published in 1645, which contains all the major Dutch voyages to the East Indies from 1594 to the 1630s. The French edition is greatly superior to the English version which only included material from the first volume of the original. The section on the voyage to Japan by the Dutch captain Hendrick Hagenaer is particularly interesting as is the Description of Japan by François Caron. The voyage of Wouter Schouten, also printed in 1725 by the same publishers, continues the story of the Dutch in the East Indies into the 1660s and forms an obvious continuation of the Receuil. Landwehr, 254 (calling for a frontis to each volume but only 22 plates) & 288.